Thank you very much for your detailed post on passport renewal. Wish I would have seen it earlier !. We are trying to take printout of filled online application. Web reference number is 14 digits, where as on the website (Government Online NRI Passport Form Already Filled) Its accepting only 12 digits. We removed the first 2 alphabets US, but it still says please input valid number. My son (18 years old) passport expired one month back. We are still not able to take printout as digits are not being accepted. Please advise how do we get our filled online application form? Thanking you in advance for all your help and keep up the good work. If you started your application on CKGS (Private company that handles passport renewal), then that web reference number is only for CKGS website. The web reference number for government website and CKGS are different. If you are talking about only government application form, then you can quickly fill it up again and take the print-out. Temporary ID: USASPXMMNZK17C (14 digit) is same as Web reference number form the website https://passport.in.ckgs.us/. Both emails I have pasted below. One when after filling up the form and second after they received payment. Thanks in advance for all your help. Please take a note of your Temporary ID that will help you resume from where you last saved your application. This will also be handy in case you wish to complete your application later or get disconnected. Below after payment was made . Indian passport renewal USA, Documents list, NRI online application form. CKGS Processing time 1-4 weeks, 3 photo. No police verification. US legal status. 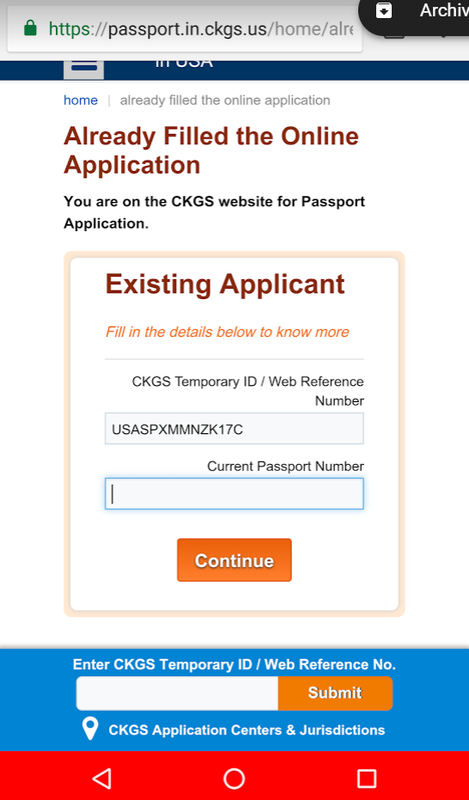 CKGS website might confuse you on this point, if you have already started the passport application and saved it. The only way to go back and see your saved documents is to use their web reference number on the box provided at the BOTTOM of their website. thank you so very much Anil. Am extremely sorry…but I still cant see the filled form. Attaching the screen shot. thank you thank you thank you. please help. So, your log in problem is solved now? The government online application form can be printed from government site. and filled up the form there? Please note that this link is different than CKGS website. Please note that you have to complete both: CKGS application as well as the government NRI passport form (the link that I gave). The NRI government application form can be filled up at government website only. Apologies for delayed reply. It was past midnight so didnt message you. My son did fill that form on other website and now we have 12 digit web reference no. i still have a few doubts. Will message you. Thank you for all your help. It was not possible without your help. Thank you once again. Let me know if you need help with it. Accha ab lagta he bete ne shayad galti kar di he…online india form wale mai…address Us ka daal diya he…and I think CKGS wale pe India ka diya he…Mujhe samajh nahi araha he…what should I do ? If I want to give USA address to be printed on passport, so is it some notary or paper work he has to do ? Or his california drivers license is enough ? M so grateful to you, you cant even imagine. Lots of duaas for you and your family for doing this good deed. I would suggest to re-start the application on CKGS website and follow their steps. In one of the steps, they will ask you to go to government’s website and fill the form there. This way, all values (addresses) can be synced. Please note that if there is any discrepancy in the data between CKGS application and government online form, they might ask you again to re-do it or delay your application. USA Address proof – Any utility bill (Electricity/gas – not older than 3 months) or driving license or Rental lease agreement or Home Mortgage bill or State ID. Please mark the post as answered, if you feel your query has been resolved. There is a check box to choose the answer. thank you …will check and re do if needed. thank you. Apologies for late reply. My son got his renewed passport within 10 days. Am not able to log in Truvisa website to reply. Appreciate all your help. Thank you very much. This link has changed as some security features were added recently. Im currently having an issue with the already filled registration form.,I don t know which one to send with the application ckgs and I am unable to retrieve the registration form for my passport renewal applicaiton. CKGS has changed the complete process. You should start your passport application from CKGS website and not the Indian government site. 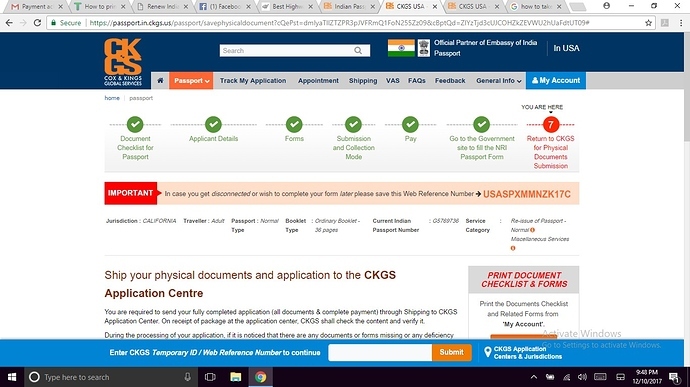 As per the new process, the government form is filled online within CKGS website. Also, when you fill the NRI form from CKGS website, it automatically connects the web reference number to your CKGS application. Looks like you have done something wrong. Hi, I have filled the entire form as per the process given on CKGS website but while trying to complete the last step “clicking on the Already filled NRI Passport form” the website does not accept my Government web reference number. I am pretty sure I am filling in the right 12 digit number (ARN) that I received on submitting the passport form on government website. Can you please help me with this issue? You have to contact CKGS support to verify this. It should have worked.